In recent weeks, America has been focused on the Trump administration’s controversial—and now ended—policy of separating parents and children at the border. Now, a new report reveals another way in which the needs of children, including some undocumented children, are being ignored by the U.S. government. The Annie E. Casey Foundation (AECF) published its an annual KIDS COUNT Data Book, which assesses the regions at the highest risk for undercounting children on last Wednesday. The 2018 report shows that nearly one in four children under the age of five lives in one of these hard-to-count census tracts. Children younger than five years old—particularly those in the most vulnerable situations—face the highest rates of undercount by the census. That matters because the census determines distribution of electoral votes and representation in Congress and dictates the allocation of more than $800 billion in federal spending, according to a study by George Washington’s Institute of Public Policy on the role of the decennial census is distributing federal funds. “If we don’t count the kids facing the greatest obstacles, we essentially make them and their needs invisible — and their future uncertain,” the AECF report says. As a result, the needs of young children are the least likely to be represented fairly in the U.S. government. They are less likely to receive adequate funding for resources like their education and healthcare. And kids in vulnerable communities across the country are the least likely to be given enough resources. Other age groups are overlooked at much lower rates. The census misses one in 20 children under the age of five, but the second-highest rate is for children five to nine years and the census fails to count one in 50 kids in this group. Within the youngest age group, the government misses Black and Latino children more than twice as often often as their white peers, according to the KIDS COUNT report. In 2015, ten of the largest programs that provide for young children accounted for a total of $160 billion in government allotments. But these funds are not sufficient to cover the population missed by the Census. In fact, the George Washington study found 37 states lost more than $1,000 per person missed by the last census when funding five Health and Human Services programs in 2015: Medicaid, the Children’s Health Insurance Program, Title IV-E Foster Care, Title IV-E Adoption Assistance, and the Child Care and Development Fund. 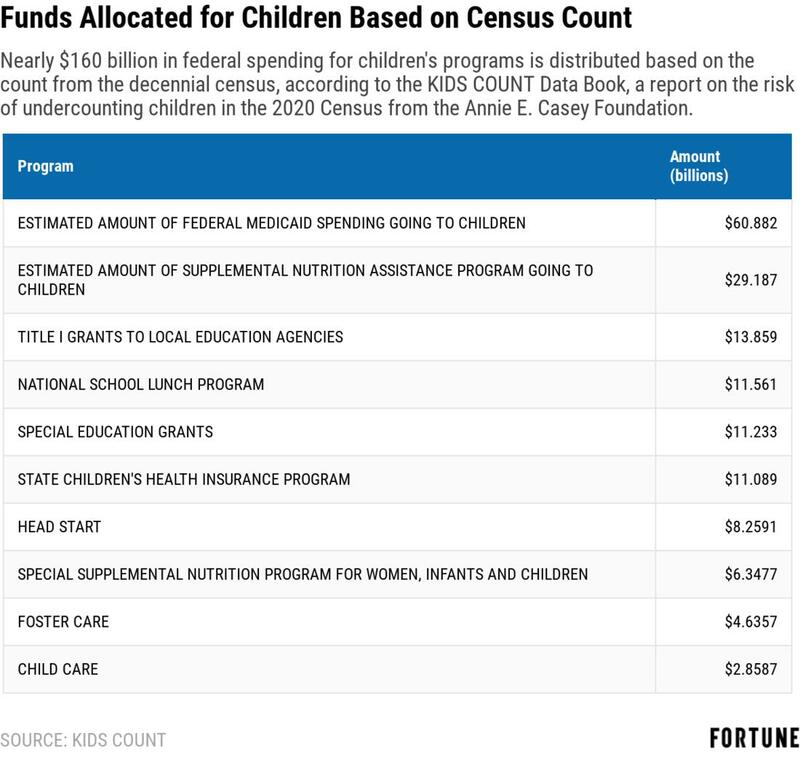 Nearly $160 billion in federal spending for children's programs is distributed based on census counts. This is not a new problem: In 2010, the U.S. Census failed to count nearly one million children younger than five. But Dr. Bill O’Hare, a demographer who has been studying the topic for the last two years, said in a presentation by the Population Association of America that the problem of counting the youngest Americans has gotten worse with each census since 1980 — during the same period that the accurate enumeration of other age groups has improved. Experts don’t know exactly why the rates of undercounting this age group are so much higher than any other, but they have identified factors that lead to less accurate counts. The foundation’s report assesses risk of children being missed based on population traits like average education levels, poverty rates, housing costs, share of non-English speaking households, and a variety of other factors that make it more difficult to collect data on small children and their families. 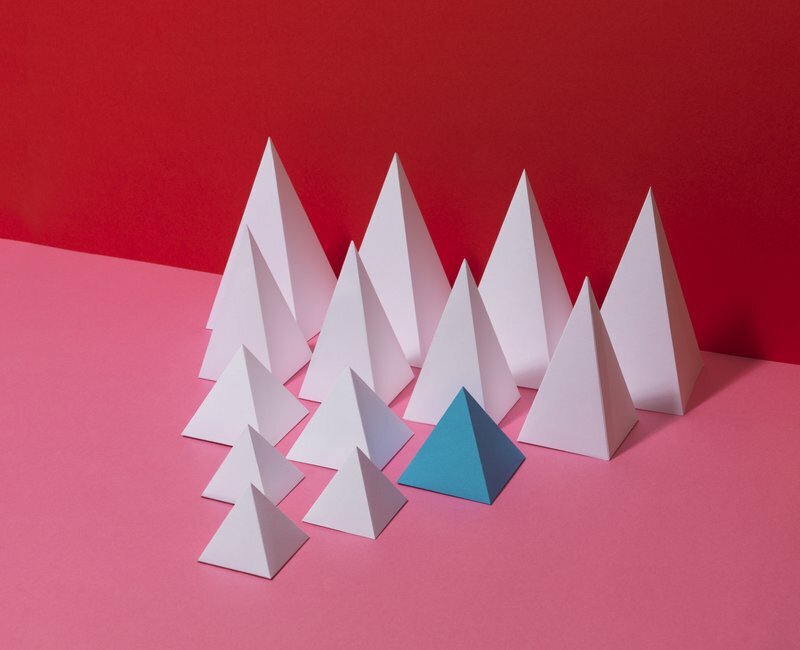 “It’s often the children who need [funding and resources] most that don’t get counted,” Laura Speer, associate director for policy reform and advocacy at AECF, told Fortune, due to the factors that contribute to the undercount of vulnerable communities. And the households most likely to be missed have a disproportionate share of young children. Since the 10-year Census is designed to be administered by household, living arrangements outside of a two-parent home make it more challenging to ensure all children have been counted accurately. “Complex living arrangements” can include families who share custody, children being raised by extended family, and households with low or no housing security, according to Speer. New Mexico came last in the AECF’s state ranking of children’s wellbeing, with the highest levels of child poverty, job insecurity, fourth graders behind in reading skills, and high school students failing to graduate in four years. 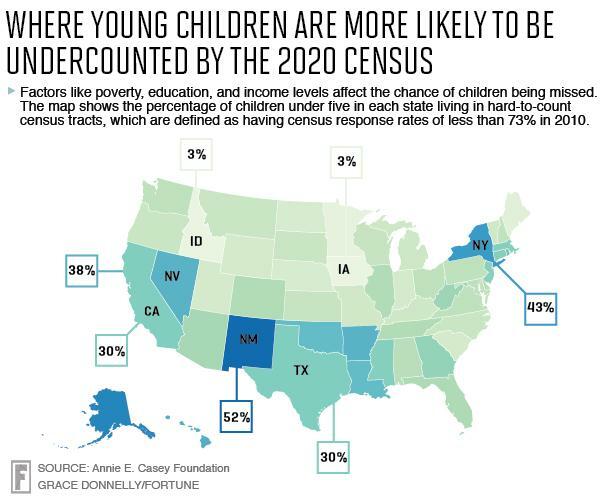 New Mexico also has the the highest population of children at risk to be missed in 2020, with 52% of census tracts returning less than three-quarters of the surveys sent out in 2010, falls into jurisdiction of the Denver regional census branch. This office is responsible for Arizona, Colorado, Kansas, Montana, Nebraska, North Dakota, Oklahoma, South Dakota, Texas, Utah, and Wyoming and currently has 11 employees, according to the region’s website. The Denver Office refused to verify those figures, instead referring Fortune to Public Information Office at the Census Bureau. The PIO did not respond to requests to confirm or correct the staff numbers listed online. In New York, home to the U.S. city with the highest percentage of immigrant residents, faces challenges as well. More than half a million kids in the state—or 43%—live in census blocks at risk of being undercounted and one in five kids lived in poverty in 2016. The New York regional census office currently employs seven people, according to their website. This staff is also responsible for Connecticut, Maine, Massachusetts, New Hampshire, New Jersey, Puerto Rico, Rhode Island, and Vermont. But even in the best case scenarios for accurate counts, like in Iowa where only 3% of children under age five live in hard-to-count zones, the Census still risks missing 7,000 young children in 2020, based on the response rates in 2010. The government’s failure to accurately represent and provide for the very most vulnerable populations in this country is a failure for all families, for the wellbeing of American children and subsequently for the future health of the nation’s next generation, explains Speer. What can be done before 2020? Speer notes that the most important thing concerned citizens can do is reach out to their local and state governments to ask what they are doing to inform their constituents about the upcoming census. It’s not too late to take steps toward improving the accuracy of counting young children in 2020. State and local governments can allocate funds to support the census, Speer says. She points to the efforts in California, where experts predict 750,000 children will be missed by the census in 2020. State officials are suing the federal government over the inclusion of the citizenship question and are working with community leaders to share information about the upcoming census in efforts to combat the undercount. And it’s especially important now, since the census bureau has already conducted some field tests of the 2020 survey, which will be the first Census distributed mainly digitally. No test run of the questionnaire including the citizenship question has been deployed so far, but experts believe it will cause noncitizen response rates to drop. The KIDS COUNT report points out that this is detrimental to accurately capturing the populations of young children when 6 million citizen children in the U.S. live in households where at least one person is undocumented. Speer emphasized that connecting with trusted local officials and community members like teachers, healthcare providers, union leaders, and clergy, is key to improving response rates in vulnerable areas and giving families the support they need to excel. There’s a tradeoff between privacy and accuracy, said former census director Kenneth Prewitt, who led the bureau from 1998 to 2001. The more infringement there is on information that people view as private, the less accurate the results will be, he told FiveThirtyEight. “And this close to the 2020 survey, it’s likely not only the citizenship question that puts the census at risk, Prewitt said. That the census is now mired in a national political conversation about immigration, as well as various court cases pushing to keep the question off the survey polarizes it in a way that could hurt response rates,” Anna Maria Barry-Jester writes for the website. “In the end it’s about all people having the right to be counted and represented,” Speer said. She says there’s been progress in the country but acknowledges that there is still a lot of room for improvement.